Everyone kept asking me, over and over, when and where we would be registering. It's not that I didn't want to register, it's that I wanted to wait. See, I knew my style would change between when we got engaged and when we got married. I didn't want to pick out silverware then that I loved, only to be completely bored with it if someone purchased it off our registry months later. And if you know me in real life, you know it is impossible for me to fake liking something. So I would be bored of the blue forks, open them, and then I would just sit there, stunned, trying to figure out how to politely say, "Thank you for purchasing this item that I wanted but now am bored of." I would definitely appreciate that someone bought me a gift because no one is required to give us anything but a smile, but still. I know me. I know my fickle tastes. I know my lack of lying. We are finally going to register tomorrow, so I put together a short list. Other than those items you can read, my list is pretty empty. I have a "wish list" on the back of that paper that includes a TV for the bedroom and a living room couch, but I can't scan those things at Bed, Bath & Beyond. We live together already, so we have quite a bit of stuff. We just got new pots and pans, we have a Keurig, we have a set of bamboo cooking utensils, we have new bed sheets. I'm not really sure what to add, and I sort of want to go in tomorrow with a plan. So I need your help. 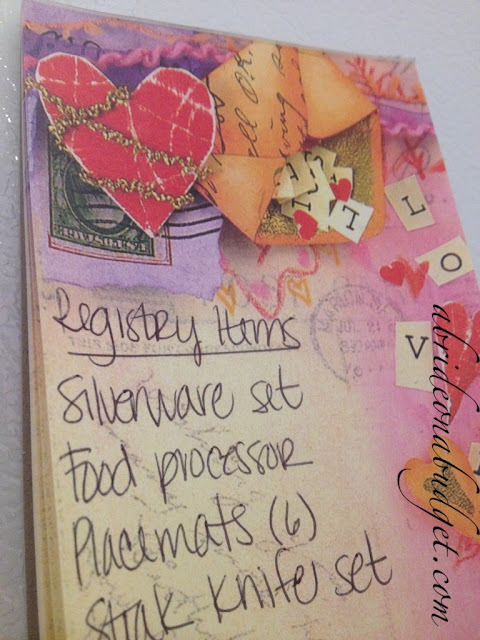 BRIDAL BABBLE: What is the one item you wish you added to your registry? What is the best item you added to your registry? What item do you wish you never added? Register for gift cards. And towels. And a few tablecloths. Also, register at more than one place. We registered at B&BW and JCP. JCP has nice couches (and other furniture and lamps and TV's) and if you register for a couch (or whatever) and gift cards, someone may see that you want a couch but not be able to afford it, but they could afford $50 to help you buy one. And the beauty of JCP is if you don't get enough in gc's to buy the couch or other large item you want, you can hold onto them and pick out some new clothes. It's your wedding, register for some weird expensive stuff you want. We registered for a bunch of crazy expesinve things that we never expected anyone to buy us, and we ended up with the Dyson Vacuum (they were very new when we got married) and a Kitchenaid. You never know! I see you have silverware set, but most sets don't include the serving ware. You might want to add those too. I loved scanning all the fancy china, etc but honestly I needed simple things mostly, like a Corningware bakeware set, and a new set of nice towels. My favorite registry item was my Kitchenaid stand mixer! Have fun & best wishes! It's amazing what you might like just walking thru bed, bath, beyond. Good knives, spice holder, nice glasses, bath things, etc. Plus they are great with returns, its one of my favorite stores and if you can't think of things I can use a few new things!! I live with my fiance too so we're also kinda stumped on registering. All of our plates and silverware is mismatched on purpose in a vintage-y sort of way (originally mine, he didn't come with much) so I'm thinking about just putting all of that in storage and starting completely over! I was reading online the other day that you can register for unconventional stuff too, like camping equipment (I would never, but some people might!) and outdoor furniture instead of the usual linens/utensils/sheets. I'm going off the whole, "I hate our toaster so let's just register for a new one" attitude which seems kind of frivolous but registries are kind of frivolous, I suppose. But seriously, let me know what you end up adding because our list isn't very long either! Spattys will be available at BB&B at the beginning of next year, lol. Disposable shower curtain liners.